Kumar is Chief Technology Officer at Tejas Networks, where he is responsible for setting the technology and product direction. 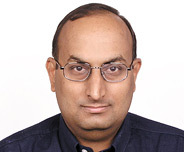 Prior to Tejas Networks, Kumar was Associate Professor in the Electrical Communication Engineering Department at the Indian Institute of Science, Bangalore. Prior to that, he worked with the IBM Thomas J. Watson Research Center, Yorktown Heights, New York. Kumar is co-author of the textbook ‘ Optical Networks: A Practical Perspective’, published in February 1998. He is a Fellow of the Indian National Academy of Engineering, an Associate of the Indian Academy of Sciences, recipient of the Swarnajayanti Fellowship from the Department of Science and Technology, and recipient of the 2004 Global Indus Technovator Award from the India Business Club at the Massachusetts Institute of Technology. He is also a recipient of the Institute of Electrical and Electronics Engineers, Inc. Fortescue Fellowship and Institute of Electrical and Electronics Engineers, Inc. Baker Prize Paper Award. Kumar holds a Bachelor’s in Electrical Engineering from the Indian Institute of Technology, Madras and a PhD from the California Institute of Technology.